LeAnn is jealous of the attention Tori Spelling is getting for her reality show, fearing her own reality show won't measure up. Whether it’s pity, shock or a whole lot of suspicion, the public has strong feelings about Tori Spelling’s revealing new reality show True Tori. 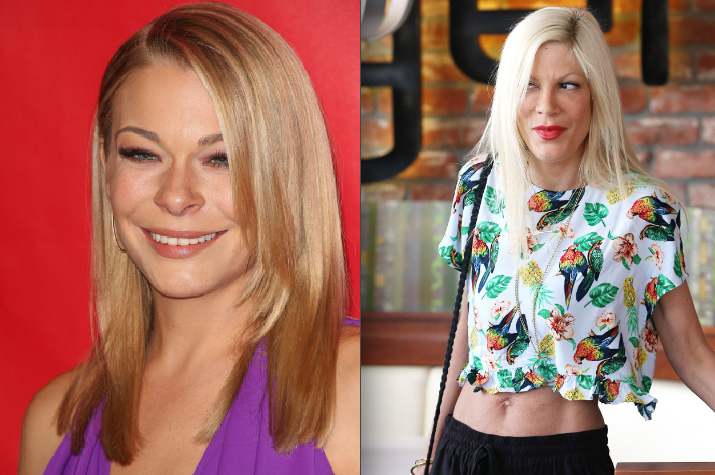 But there’s one viewer out there who actually feels jealous – fellow fame-seeker, LeAnn Rimes! Star has learned that the country singer is jealous of all the attention Tori has been getting from the show, and fears that the success of the Lifetime series will detract from her own upcoming reality show, LeAnn and Eddie, which premieres this summer on VH1. “She believes her life will be a bore compared to Tori’s,” an insider spills. The source adds that LeAnn has always craved attention — even if it comes from the drama of a crisis-ridden life like Tori’s. Both women were married to other men when they met and slept with their (also married) now-husbands. But while LeAnn is still widely known as a cheater and homewrecker, many seem to sympathize with Tori because of her philandering husband, Dean McDermott — and LeAnn believes this redeemed image comes from the actress’ show. i'm sick of 'reality' shows. they're nothing more than heavily scripted soap operas with has-been, never-were or wannabe celebs.